This week we are looking back at the discovery of Io and the other Galilean satellites by Galileo Galilei 400 years ago tomorrow. Yesterday, we took a look at Galileo's first scientific observations with his new telescope in the fall of 1609 which included the viewing of mountains and craters on the Moon and stars fainter than what would normally be seen with the naked eye. We also looked at Thomas Harriot's observations of the Moon in the summer of 1609, providing an example of the kind of tip of the iceberg the telescope's invention was in 1609. Today, in part three of our series of posts in commemoration of the discovery of Io, we examine the research of another contemporary of Galileo's, Simon Marius, who claimed to have discovered the Galilean satellites before Galileo in December 1609. Then for the first time I looked at Jupiter, who was in opposition to the Sun, and made out some tiny stars, sometimes following, sometimes preceding Jupiter in a straight line with him. First, I thought that they were of the number of those fixed stars ... However, as Jupiter was then retrograding, and still I saw these stars accompanying him throughout December, I was at first much astonished; but by degrees arrived at the following view, namely, that these stars moved round Jupiter, just as the five solar planets revolve round the Sun. In late 1608, as news of the Dutch discovery of the telescope spread across Europe, one of the inventors traveled to Frankfort in an attempt to market it. The news of an instrument that made "the most distant objects be seen as though quite near" caught the attention of John Philip Fuchs, Lord Privy Councilor to the Margraves of Brandenburg-Ansbach. He attempted to buy the telescope from the Dutch glass maker. While he was allowed a demonstration of it, he found the price unacceptable. 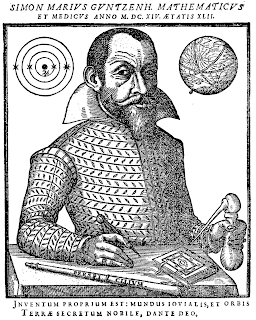 Upon his return to Ansbach, Fuchs met with the court astronomer, Simon Marius (latinized from Simon Mayr), and they attempted to fashion their own telescope, but their were unable to get a working model since they didn't know how to polish glass and the lens makers in nearby Nuremberg didn't have the right tools. By the summer of 1609, enough copies of the telescope were being made in the Netherlands that the prices had come down substantially since Fuchs first attempt to buy one the previous autumn. With a newly purchased telescope, Simon Marius set to work making astronomical observations with it from both the home of the Lord Privy Councilor and at Marius's home at the Ansbach Observatory. As described in his 1614 book, Mundus Iovialis anno M.DC.IX Detectus Ope Perspicilli Belgici (translated from the Latin title as "The World of Jupiter discovered in the year 1609 by means of a Dutch spy-glass"), Marius began to observe Jupiter in late November 1609 as the planet approach opposition, when Jupiter was opposite the Sun in the sky and thus allowing for more time for observations at night with Jupiter high in the sky. It was during this observations that he noted at least three stars adjacent of Jupiter. When the stars continued to move with Jupiter even when it was moving retrograde during opposition in December 1609, he realized that the "stars" were actually moving around Jupiter, just as the planets moved around the Sun. When Marius came to this stunning realization, he began to record his observation on December 29, 1609, observing three of the moons to the west of Jupiter. One thing to keep in mind about this observation was that Simon Marius, being a Lutheran, was using the Julian calender, just as the rest of the Protestant world used at the time. December 29, 1609 in the Julian calendar is equivalent to January 8, 1610 in the Gregorian calendar, used by Galileo Galilei and those in other Catholic countries. In fact, Simon Marius's description of the positions of the Galilean satellites in his first recorded observation match those of Galileo for January 8. According to Marius in Mundus Iovialis, he continued to observe the Jupiter system until January 12 (January 22 for Galileo), at which point he determined that he was observing four bodies revolving around Jupiter. Following a trip to Swabia in Southwestern Germany, Marius returned in February 1610, and after discussing his observations with Fuchs, he was given permission to use the telescope on a more permanent at Marius's observatory. This allowed Marius to make more continuous, detailed observations of Jupiter's satellites. From the observations Marius acquired over the next few years from his observatory, eventually using an improved telescope of his own creation, he was able to determine that the four moons each orbited Jupiter in roughly circular orbits with different orbital velocities, with faster velocities for the innermost moons and slower velocities for the outermost. Marius was also able to work out the orbital periods for each of the four moons, coming quite close to modern values for their periods. For example, his orbital period for Io was 1 day, 18 hours, 28 minutes, and 30 seconds, differing from the modern value by 56.5 seconds. He noted that each of these moons orbit parallel to the ecliptic and that on occasion, the moons would appear either north or south of the equator of Jupiter, the result of Jupiter axial tilt (though not a conclusion Marius reached). Marius would also note that Jupiter eclipses the inner moons during each orbit, causing Io and Europa to fade from view. Simon Marius's treatise on his observations of the Jupiter system (as well as sunspots), Mundus Iovialis, was published in 1614, which included the first table of predicted positions for the satellites. In his book, Marius acknowledged Galileo as the discoverer of the new worlds of Jupiter, "The credit, therefore, of the first discovery of these stars in Italy is deservedly assigned to Galileo and remains his." Clearly, one could make the argument that he is quibbling when he says that Galileo was the discoverer IN ITALY, while he was the German discover of the moons. Marius's supporters in Germany would later try to make the further claim that Marius was the sole discoverer, beating Galileo. Now four years after my Sidereus Nuncius appeared, this same fellow [Simon Marius] (in the habit of trying to ornament himself with other people's works) unblushingly made himself the author of the things I had discovered and printed in that book. 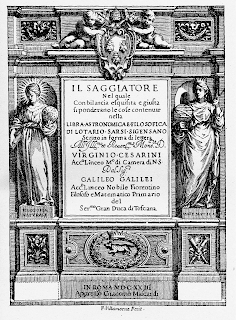 Publishing under the title of Mundus Iovialis, he had the gall to claim that he had observed the Medicean planets which revolve about Jupiter before I had. But note his sly way of attempting to establish his priority. I had written of making my first observation on the seventh of January, 1610. Along comes Marius, and, appropriating my very observations, he prints on the title page of his book (as well as in the opening pages) that he had made his observations in the year 1609. But he neglects to warn the reader that he is a Protestant, and hence had not accepted the Gregorian calendar. Now the seventh day of January, 1610, for us Catholics, is the same as the twenty-eighth day of December, 1609, for those heretics. And so much for his pretended priority of observation. So Galileo clearly took offense, despite Marius's attempt in Part 1 of Mundus Iovialis to relieve that possible tension. Now who should have credit? Personally, I feel Galileo was right to point out the difference in calendar systems being employed between the two scientists. Certainly the first observation Marius recorded on December 29, 1609 in the Julian Calendar matched the second of Galileo's observations from January 8, 1610 in the Gregorian Calendar. Whether Galileo is right about Marius out right plagiarizing his work (again? ), I don't think we can say. Marius clearly was observing the Jupiter satellites starting at least in 1610, with enough observations for him to come up fairly accurate orbital periods for the satellites. Still, based on the fact that Galileo has a recorded observation, that has been verified using mathematical theories of the orbits of these moons, from the day before Marius's first recorded observation, gives Galileo the sole credit for the discovery. Marius's claims that he was observing the moons as early as late November 1609 can't be verified because he didn't record what he saw. Jupiter is much blamed by the poets on account of his irregular loves. Three maidens are specially mentioned as having been clandestinely courted by Jupiter with success. Io, daughter of the River Inachus, Callisto of Lycaon, Europa of Agenor. Then there was Ganymede, the handsome son of King Tros, whom Jupiter, having taken the form of an eagle, transported to heaven on his back, as poets fabulously tell, and notably Ovid. I think therefore, that I shall not have done amiss if the First is called by me Io, the Second Europa, the Third, on account of its majesty of light, Ganymede, the Fourth Callisto. Tomorrow, January 7, we will take a look at Galileo's observations of the Jupiter system, and how he came to view them as moons of Jupiter.